SugarDaddyForMe used to be the most famous sugar daddy dating website in the world. It was launched in 2004, now it has over 4 million members and over 1,000 new sugar daddy and sugar baby profiles every day. 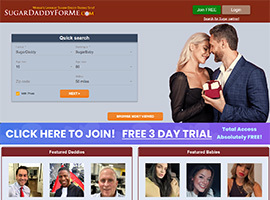 Different from other sugar daddy websites, SugarDaddyForMe serves a broad user base, including male sugar daddy, female suagr baby, gay sugar daddy, sugar momma, and male sugar baby. So if you want to try diverse sugar daddy relationships, come to SugarDaddyForMe and it also offers a 3-day free trial. You don't have to spend a single dollar to get free membership. However, the paid membership is divided into Golden and Silver accounts. The Basic Gold Membership is $39.90 for a month. Gold Membership that allows all non-paying members to contact you costs $54.85 every month. Standard Silver Membership is for $34.90 per month. The price of Silver Membership that can make every standard member to browse your profile and contact you is $49.85 for a month. The payment can be made using Online Check, Credit Card or Money Order. The credit card bill will not say anything about SugarDaddyForMe.com; instead, you will have RGhelp.com or SCbills.com written in the statement. SugarDaddyForMe.com helps you create free profiles with photos, personal information or heading. There is absolutely no limit in posting images online and posting several images lets people know how you look. You can view the online members and browse through their accounts and photos. The latest feature allows you to keep tab on the messages you receive from the members. In case you get suspicious on any of the account holders, you can report abuse or block him from viewing your profile. In addition, SugarDaddyForMe.com helps you make a weekend planner. Let others know what you are planning for the weekend and let them come up with their ideas accordingly. You can also check the addresses mentioned by the sugar daddies in their accounts on Yahoo Maps. With the help of member IDs or usernames, you can find the members who have registered at the SugarDaddyForMe site. The best feature amongst all is that you don't have to wait in queue to get your profile approved. It only takes 10 minutes for the site to confirm your profile and lead you to a community which will help you forget all your worries and let you enjoy to the core. You can access emails through the control panel and save all the search results you make. The results can be refined even through body type, marital status and race of the sugar daddy or sugar baby. One of the best attributes of finding a sugar daddy through SugarDaddyForMe is that you can enjoy the three day free trial. You don't have to pay for any of the membership accounts. As it is free, you can see a huge member base once you sign up. Most of the free accounts are preferred by sugar babies who are looking for rich sugar daddies. Once you have created your profile, you can easily use the instant messaging service available for the members on the site to connect and enjoy the benefits. Moreover, you can find a number of sugar daddies who have a specific budget and allowance for their sugar babies. These sugar daddies are rich and wealthy, and are looking out for girls who can spend their valuable time as per the tight schedules of sugar daddies. The design of the website of SugarDaddyForMe.com may not be considered to be user-friendly, though you can enjoy maximum benefits. This is because, you have to try and check many functions before you use one. At the earlier stage, you have to trace the member on the basis of location and then can channelize the target. One of the major drawbacks is that you cannot see the profile images on many of the accounts. This is due to the website particularly aiming at bringing bold girls with rich men together. Though the prices for paid membership accounts are economical, you need to cancel the auto-renewal option. In case you do not remember to uncheck this preference, your bank account can be billed every month without your notice. Hence, make sure automatic billing option is disabled after you make the first payment. SugarDaddyForMe.com is the ultimate website for girls who are no longer interested in young boys with no money but like to be coddled and spoilt by older wealthy men. On the contrary, if you are a rich man who is seeking to have a bold and beautiful girl to date, you are at the right place as you can meet many sugar babies who can throw themselves on you in return of lavish lifestyles. With good customer support, you can give SugarDaddyForMe.com a try to add some sugar to your life to make it sweeter.